The UK Government has announced that it will shortly consider announcing the dates of the digital radio switchover. I thought it might be an excellent time to consider the history of amplitude- and frequency- modulation - and to wonder why anyone is still using it. These were, in 1922 2LO from London, 5IT from Birmingham, 2ZY from Manchester, 5NO from Newcastle upon Tyne; in 1923 5WA from Cardiff, 5SC from Glasgow, 2BD from Aberdeen, 6BM from Bournemouth; and joined n 1924 by 2BE from Belfast. This wasn't down a "commitment to the regions", but the limits of the technology. It was possible to set up medium wave transmitters in populated cities. Even though "trunk" telephone calls could be made from 1923, these were not suitable to create a radio network. From 1927, the BBC Regional Programme moved to higher power transmitters to provide a service that covered the country. The "basic regional programme" from London acted as a sustaining service to the Midland, North, Scottish, West, Midland, Northern Ireland (opt out from North), Welsh (split from West) , North East/Cumbria (opt out from North), and West regional services. This was known as The Regional Scheme. Long Wave, high power services were tested in the late 1920s, and March 9th 1930, broadcasting to the whole of the UK from Daventry, the BBC National Programme started. Borg the Regional Scheme and National Programme services were mixed mainstream radio service, with a variety of programmes to suit all tastes. Listeners could switch between stations to choose programmes, but both would carry all forms of radio. This is all shown in exquite detail in DEVELOPMENT OF THE A.M. TRANSMITTER NETWORK Compiled by Clive McCarthy Version 4, 15 May 2004 [pdf]. Worried about enemy aeroplanes using the radio towers to triangulate bombing raids, the transmitter network was reconfigured on September 1st 1939 to use just two frequencies (668 and 767kHz) and provide a single national programme. This service was known as the Home Service. Long Wave's National Programme was closed down. From January 1940, this was joined by a lighter service called "For the Forces", later the General Forces Programme. From July 29th 1945 the Home Service with its drama, talks and informational programmes was split into six regional services (Basic, Midland, North, West, Welsh, Scottish), and in 1963 Northern Ireland. The Forces format became the Light Programme on Long Wave and Medium Wave. There is an excellent description of this service at Radio Rewind - Light Programme Menu. From 29 September 1946, the Third Programme was added. It broadcast from 6pm to midnight a mixture of cultural and intellectual programmes, but this was changed in October 1957 to carry educational programmes, and was changed to having all day classical music with the BBC Music Programme, in 1965. 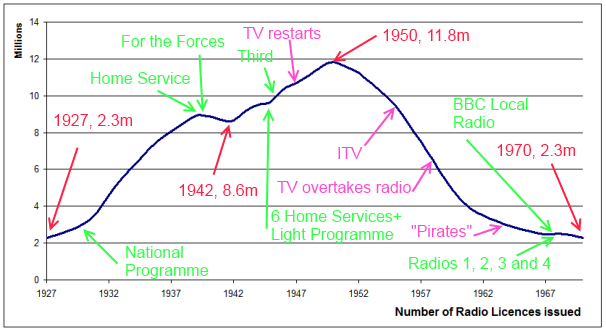 However, television, restarting after the war, with ITV coming on air in 1955 and BBC TWO in April 1964, took audiences away from radio, especially in the evening. In the mid 1960s, a new challenge happened from pirate stations, which were literally broadest from off-shore locations. They introduced the concept of "pop music" to UK radio, and the playing of gramophone records, rather than having (at the instance of the Musician's Union) live music. To this end, the BBC, still the sole legal provider of radio issued "Broadcasting in the Seventies". This document, which was much discussed in the press and Parliament at the time, made two major decisions: the move from regional radio to local radio, and the national stations being reorganised into genre-based stations. The Light Programme was split into three: "pop music", with DJs playing gramophone records would be Radio 1. The "light music" would become Radio 2, with a mix of DJs and live music. The Light Programme's drama (The Archers), comedy (such as Round the Horne), politics (Any Questions?) and other speech (such as Woman's Hour) would move to Radio 4. Radio 4 would also take the speech and drama from the Third Programme, and this would all be added to the basic Home Service. Radio 4 would generally be a UK-wide service. The Home Service for Wales, Northern Ireland and Scotland would become Radio Wales, Radio Scotland and Radio Ulster. Only in the South West (until 1983) and East Anglia (until 1980) where there were no BBC local radio stations, would there be regional opt-outs from Radio 4 UK, aside from five-minute regional news, which were phased out in 1978. The four BBC networks broadcast on the medium wave (with the exception of Radio 2, which was on long wave) as well as VHF. Read more about this: BBC Engineering No 87 July 1971 [pdf] and BROADCASTING IN THE SEVENTIES (B.B.C. PLAN) (Hansard, 22 July 1969) also The History of Broadcasting in the United Kingdom: Volume V: Competition - Asa Briggs - Google Books [page 719] and Life on Air: A History of Radio Four eBook: David Hendy: Amazon.co.uk: Kindle Store. There was a final change to the networks on November 23rd 1978, when Radio 4 moved to 200 kHz Long Wave, Radio 1 to 1053/1089kHZ, Radio 2 to 693/909 kHz and Radio 3 to 1215kHz. By 1990, most homes had moved - after much complains in some parts - to VHF reception. The BBC took the medium wave from Radio 2 and created Radio 5 (later 5 Live), and in 1992 the BBC handed over Radio 3's medium waves to Virgin Radio, and 1994 Radio 1's medium wave frequencies to Talk Radio (now Talk Sport) . DAB coverage will have to improve significantly if FM is removed. We live in the West Midlands and for some stations are in an area that can almost receive broadcasts from two different Heart FM stations. I say almost as whichever one we tune to will, on regular occasions, drop out. I am currently receiving Radio 4 on 756MW. Is this because of the disruption of Radio 4 on 198LW? Where I live in a rural part of Wiltshire, we get pretty good AM (LW & MW) reception, marginal VHF FM reception and very poor DAB reception. If they close the AM transmitters we will only have variable FM reception or unrelaible DAB or be forced to try internet radio which is suspect as we have poor broadband (we're in an 'intervention' area but no likelihood of any developments anytime soon!). That's not an untypical scenario for many rural areas and that's why it is essential that the AM transmissions be maintained for the foreseeable future.